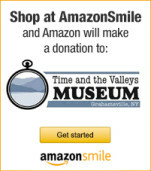 Please consider donating to the Time and the Valleys Museum. Your donation will help us preserve the history of the Rondout and Neversink Watershed areas, and create programs, projects and exhibitions on many different local history subjects for both children and adults. Giving is easy! Just choose what most interests you from the list below, and complete the information required on the next screen. Donations can be given in honor or memory of a loved one, or you can choose to be anonymous. Recognition is given to donors who desire it through plaques, panels, programs and other media. You may make your donation in the memory of, or in the name of a friend, family member or loved one. Please fill out the person’s name in the “In the name of/In memory of” box when entering your donation at PayPal (this is normally on the page after entering your donation amount). A donation to the Terry Forshay Endowed Fund is a gift for the future. Your donation will be added to the principal in the fund, and only the interest it creates will ever be utilized. Our financial security grows with this important fund. An important multi-year project, this farm will preserve the memories and artifacts from an earlier, simpler way of life, before NYC came to the area to take our water. Funds donated to this project will help create displays within the farm buildings, fund creation of audio tours and help with maintenance costs. While not the most glamorous, it is the most important giving need. General operating costs include utilities, salaries, and helping us keep the Museum open to the public. Each year, the Museum creates many free educational programs that are open to the public, for both children and adults. Our educational programs attract visitors to the Museum and educates them on many local history subjects, and they’re fun, too! Currently we are creating a field trip program for elementary schools, which needs both funding and lots of volunteers. The Museum has a large collection of photographs, books, maps, tools, clothing, household items and many other artifacts. To preserve and store these artifacts and photographs is ongoing and extremely costly, as we receive new items weekly. Funds received for collections will be used to purchase acid-free boxes and containers, which are needed for items that are awaiting proper storage. Donations are tax deductible to the extent allowed by law, and you will receive a thank you letter for tax purposes.